A good network of agencies ensures an optimal coverage of your territories. However, one can frequently spot « holes », or uncovered areas, which may hold interesting potential. By crossing market data (activity of competitors, target population) with internal company data (branch activity), one can pinpoint possible imbalances and make simulations to correct them. This interactive atlas allows geomarketing researchers or actuaries to compare internal data about the performance of their network with an analysis of the competitive landscape. 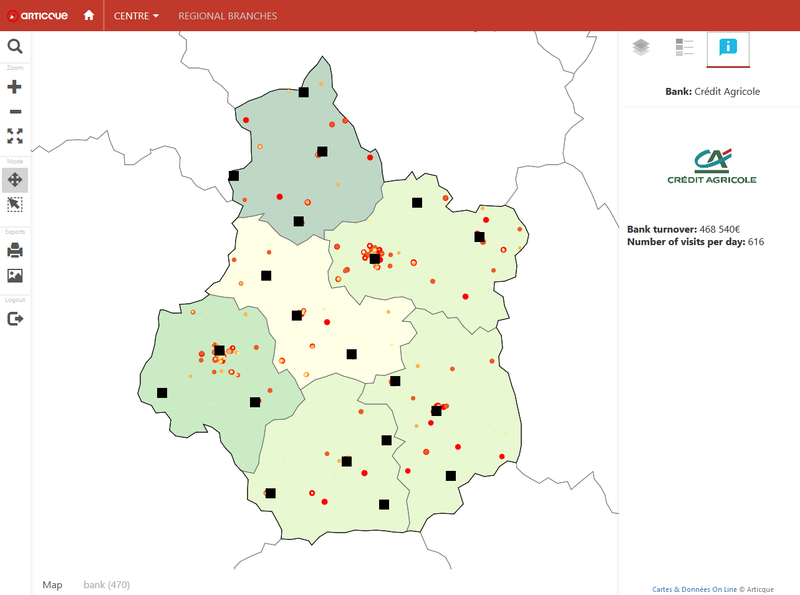 The first level of the atlas allows the researcher to observe the geographical distribution of various banks’ market shares. The researcher can see at a glance where their bank is in a leading position and where an action plan is required to gain market shares against competitors. Double-clicking on a region allows the researcher to access a finer vision of his branches’ performance and of the market attractiveness of competing banks. Clicking on a branch belonging to his network or to his competitors’ opens a data sheet in the sidebar which details the branch’s number of visits per day and turnover. 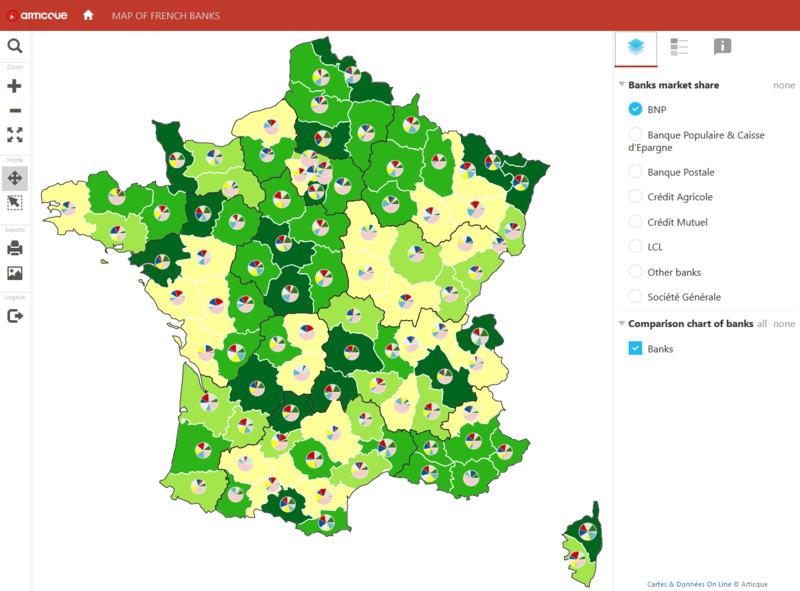 The « Layers » tab also lets him display other indicators on the map, such as the distribution and activity of ATMs, or data about the banking activity per department (average withdrawal amount, average portfolio per client…). He can zoom in on one of his branches (symbolized by a square) by double-clicking on it. Then he can display the areas located within a 10, 20 or 30-minute car ride from the branch. Doing so allows him to picture the branch’s potential attractiveness thanks to indicators such as the number of inhabitants in the area; he can also measure competitive pressure by observing the number of branches from competing banks located in his catchment area.